There's no competition in my garden between the foliage plants and the flowering ones. Naturally I love them both equally. A garden with no foliage would have no soul, and flowers need greenery (and leaves of other colours) in order to shine. I've always adored foliage plants. I entered my variegated phase in 1999 after reading some inspired American gardening books. Since then my feelings for stripes and spots have been running hot. Then I started my Hosta phase. Hostas are considered by some gardeners the finest foliage plants of all. 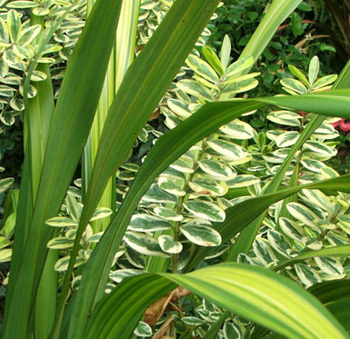 My favourite foliage plants below are a bit random, like the garden they live in. Some of them have done time in world famous perennial borders. Others have the most beautiful flowers as well as leaves. I hope you enjoy my choices. Gunnera is a dramatic plant, one which amazes visitors with small gardens. The huge leaves are strong and inflexible, covered with minute spikes. Wind can shred them, and the edges can get burnt by late frosts, but gardeners shouldn't attempt to touch them. Bronze fennel is the ultimate foliage perennial, but it takes a brave gardener to embrace and grow it. When I bought my first two dollar pot the nursery owner warned me - bronze fennel could become a nusiance. My purple leafed sage, which I grow each year as a foliage plant, is in good company, according to my latest gardening library book. This humble herb occupies a quarter of the colour cover! One should never ever take one's own ability as a gardener too seriously! Or, to be more specific, one's ability to correctly identify an ornamental rhubarb plant! Angelica, the common garden variety, is one of my most favourite foliage plants. It has form, texture, and above all, a strong shiny green colour. And a beautiful name! Aralias are beautiful big foliage plants which I grow outside in sheltered places. In the middle of winter their fingered green leaves shine in the sun. The crinkle leafed Ligularia that some bright nurseryman decided to call Martian Invader has been a favourite foliage plant of mine for some years now. I grow it in the shelter of overhanging trees by the water. Iris Japonica, or Japanese Iris, is my dream foliage plant. I pull existing clumps gently to pieces and poke the separate bits straight back into the soil. Finally after years of neglect I now have a picture of its icy white flowers. In the garden under the variegated elm tree these two New Zealand natives make a pleasing pair. The foliage contrast between the small round Myrtle (Lophomyrtus) leaves and the carex grass is subtle and beautiful all year round. Acanthus are foliage perennials affectionately known as Bear's Breeches. I've stared for long periods of time at my Acanthus patches without ever managing to make the connection. Black Mondo Grass is a super stylish foliage plant, found in designer gardens all around the world. Clumps of Black Mondo Grass in the non-designer Moosey garden sometimes struggle to be seen and appreciated. I grow two varieties of perennial Helichrysum Petiolare, which I commonly know as Curry plant. It's treated as half-hardy in my garden, so usually lives in pots - placed out in the garden in late spring, and collected, pruned and popped into the glass-house for winter. I am very rude about the many Pittosporums growing here in the garden, speaking mainly about pruning and chopping them down. I need to set the record straight - Pittosporums are very beautiful foliage shrubs and trees. The clumping grass Miscanthus zebrinus has beautiful horizontal stripes - lemon on green. It's a big but well behaved customer, and the winter silvery seedheads are fine and intricate. This will sound like a nursery story, but once apon a time there indeed was a well behaved Golden Hop whose job it was to cover a tree stump. The rest of the story becomes a gardener's nightmare. The hop grew, and grew, and grew. I bought this euphorbia from my local nursery in a plant sale. I wanted to increase my collection of euphorbias, as I liked how easily they seemed to grow here. I'm sorry that I don't remember what it was called. One of the first grasses I bought was from a mail order catalogue. I chose it because of the name - Calamagrostis. It sits in a tidy clump in Stephen's border, and the seed heads wave gently in the wind. I grow the large blue flowering Agapanthus at the top of the driveway border, underneath a large gum tree. The soil there is quite dry and yet these plants seem to do well. I love their clear green foliage. I grow a cream and green variegated pelargonium which has bright cherry red flowers. It's great in pots and planter boxes, or in borders to lighten up and contrast with the darker plantings. I always have cuttings growing on. I grow many varieties of sedums, like the famous 'Autumn Joy', and enjoy them for their artistic qualities. I have both variegated and plain versions for the bees to visit. I think this is the Pulmonaria with that very descriptive name, 'Spilt Milk'. The leaves certainly look like milk has been splashed all over them. All my pulmonarias grow well in the shade, but I have to be careful that they get extra watering in summer. The area by the Stables is very very dry, and there is no irrigation to help. Plants here have to suit this situation, and one which seems totally happy is the leucadendron Safari Sunset. It's in full sun all year round. My local bargain bin often puts out pots of Heuchera, and I always grab them. I like the contrast that their leaf colour makes with neighbouring greens.